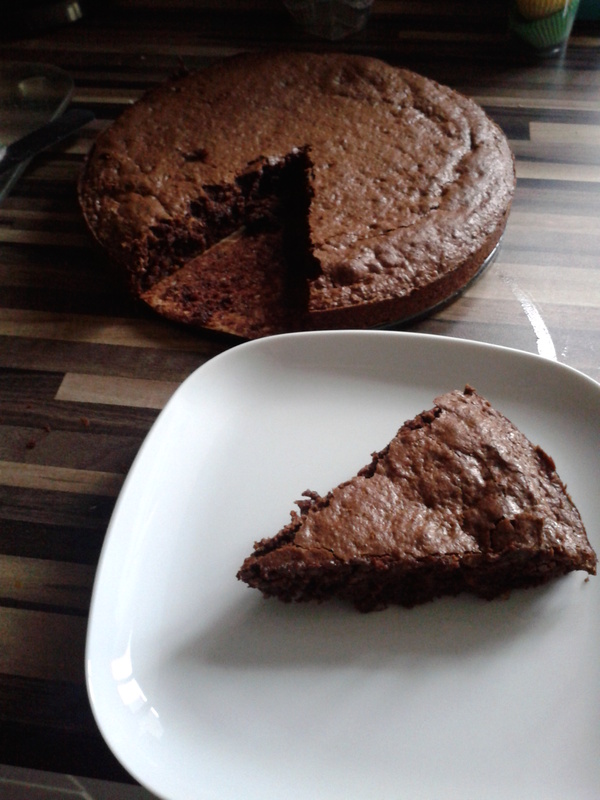 I’ve been testing a wheat-free and butter-free chocolate cake over the last few weeks. I’ve really enjoyed it – getting up at 7am on a Sunday morning in the quiet of the house and cooking chocolate was a magical and special ‘me’ time. I’ve made versions of this cake; too sweet, too moist – think fondant not cake, too dry and with too much chilli at one point! This cake recipe has finally been agreed – thanks to all my neighbours and friends for their willingness to try, patience and feedback. Melt the chocolate in a glass bowl over a pan of hot water, simmer slowly. Let the chocolate melt gently and don’t be tempted to stir. Once melted stir in the olive oil. I prefer to use 60g of hazelnuts but if you wants a slightly bitter taste use a mix of walnuts. Add all the rest of the ingredients and the chocolate mixture to a food processor and blend – it doesn’t need to be super smooth actually some texture from the nuts is better. You will need a cake tin with a removable base so it is easy to get out. I used baking paper to line the base – draw around the base with a pencil and cut it out the circle. Grease the sides of the tin with some olive oil but not too much otherwise the cake will be too oily. If your tin is like mine when you put the base back into the cake make sure you have it the right way up – the ridge edge needs to be underneath the cake tin – lesson learnt the messy way! Pour the cake into the tin and pop into a preheated over at 175 degrees for 20 mins until a skewer is clean when inserted and removed. The cake should be moist and slightly gooey, it goes very well with ice cream, a well deserved coffee or a naughty liquer. Please note that this cake will not rise like a wheat flour cake would do – think more chocolate brownie than birthday cake! This entry was posted in Recipes and tagged butter-free, Cake, chocolate, Chocolate cake, dark chocolate, Gluten, gluten-free, hazelnuts, intolerance, Olive oil, walnuts, wheat-free. Bookmark the permalink. I’ve never tried a Nigella recipe as usually want something healthier but lately got into cakes mainly because of our supperclub! Thanks for the suggestion will look do a google search.